That’s what the postmark says, but the photograph the card is based on probably dates to several years earlier. New York has lots of beautiful ballroom, bar, and lobby ceilings. One of the most magical is at the Bethesda Arcade—the arched walkway in the center of the park that brings you to Bethesda Fountain and the Central Park Lake. 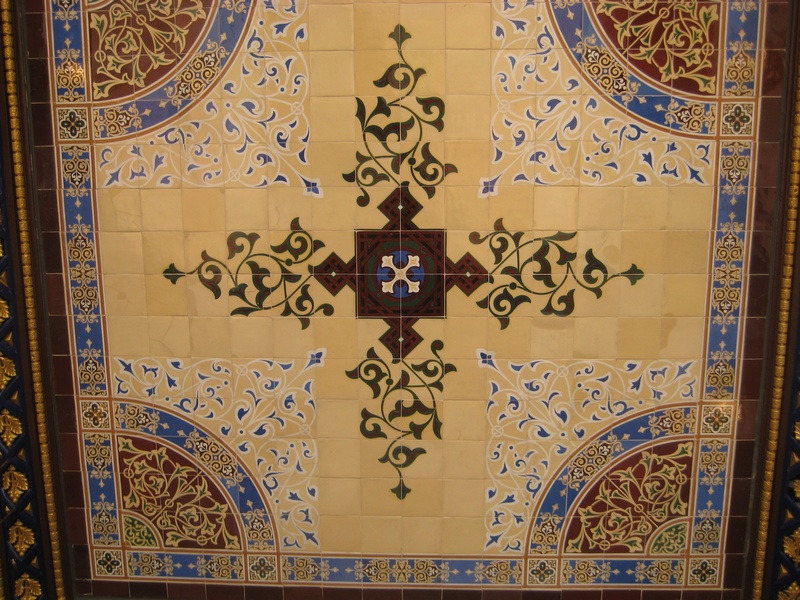 “Installed in 1869, there are more than 15,000 colorful, patterned encaustic tiles, made by England’s famed Minton Tile Company,” states centralparknyc.org. Dirty and weathered over time, the tiles were taken down in the 1980s and put in storage until 2007, when the newly restored Arcade was reopened to the public. It’s hiding in plain sight in the middle of the park. But it’s lovely and worth looking out for. At Concert Grove there is a long low wall—built in 1874 as a place where carriages could be fastened. 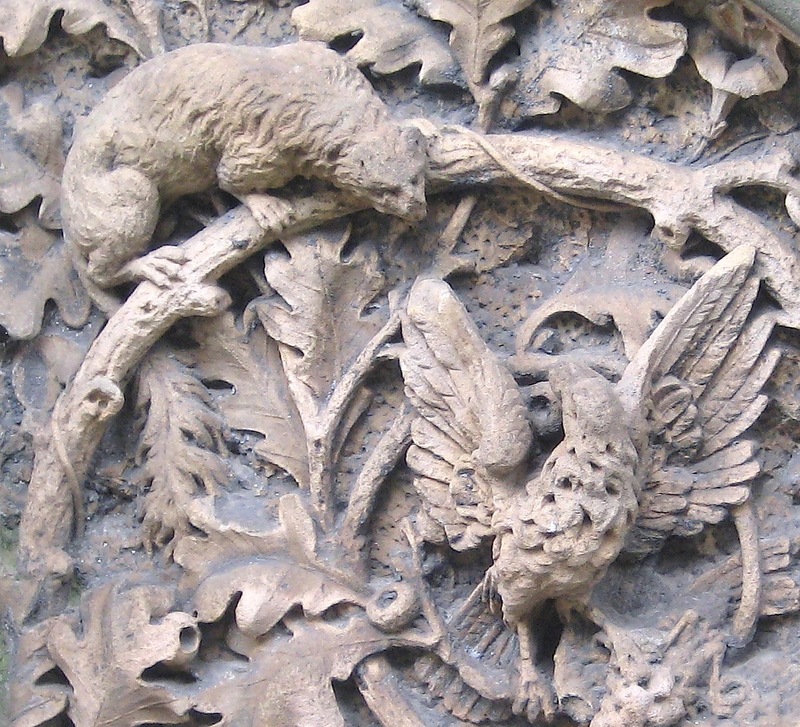 At the end of the wall is a stone entryway carved with images of leaves, branches, and flowers—as well as a couple of birds, one who is currently in the sights of a cat, ready to pounce. 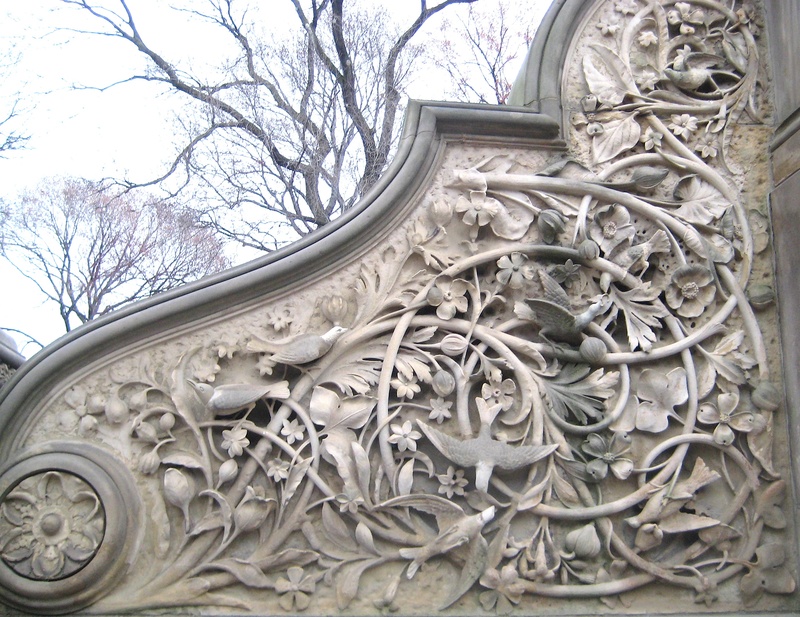 It’s a lot like the stone carvings of Central Park’s Bethesda Terrace. No wonder: Both parks were designed by Frederick Law Olmsted and Calvert Vaux. 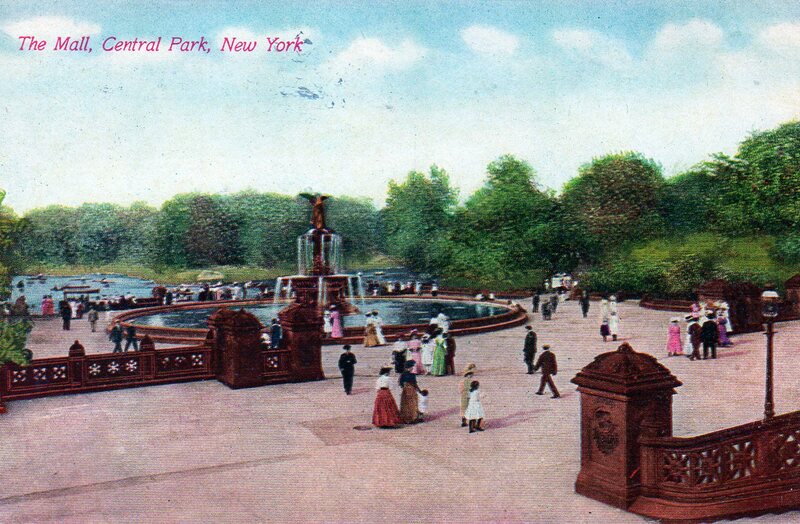 Central Park came first, but supposedly Olmsted and Vaux considered Prospect Park the better one. 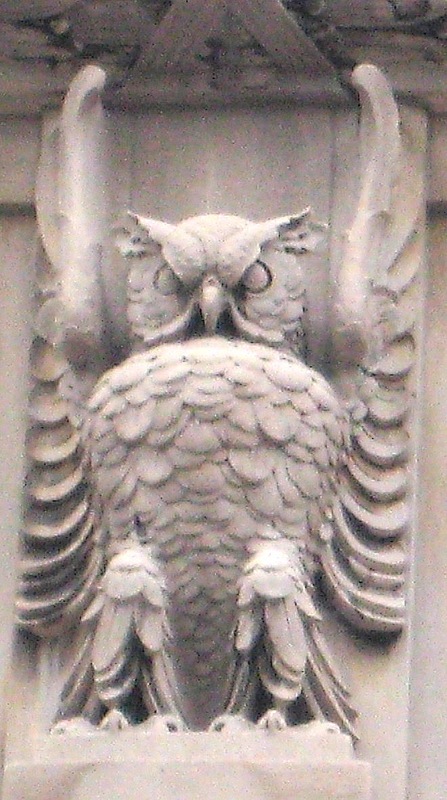 It makes sense that many old city school buildings are decorated with carved owls; owls symbolize wisdom. 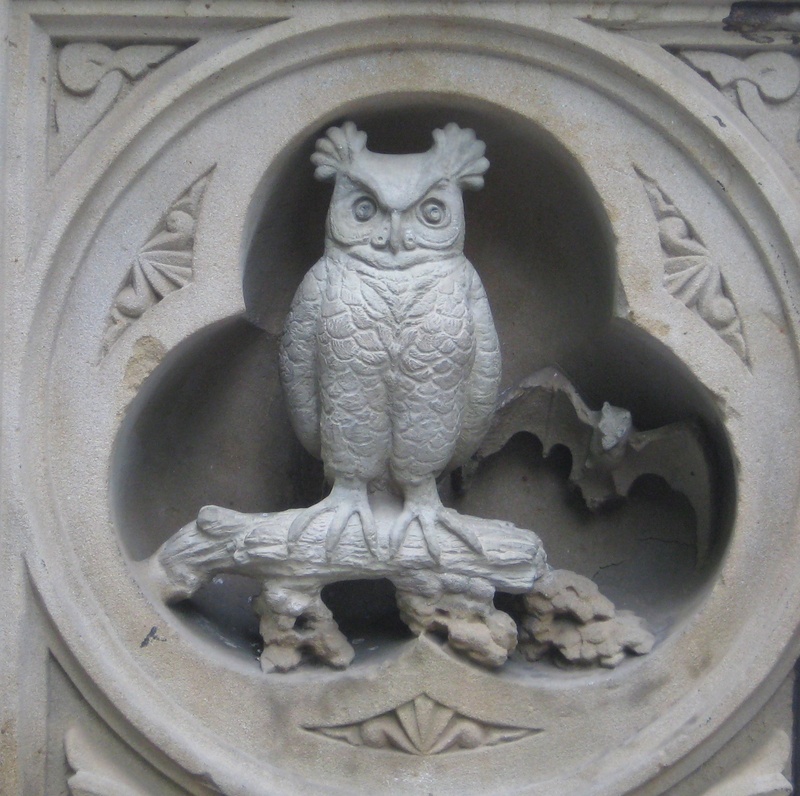 But owls—some spooky, some goofy—adorn all kinds of buildings and structures in New York City. 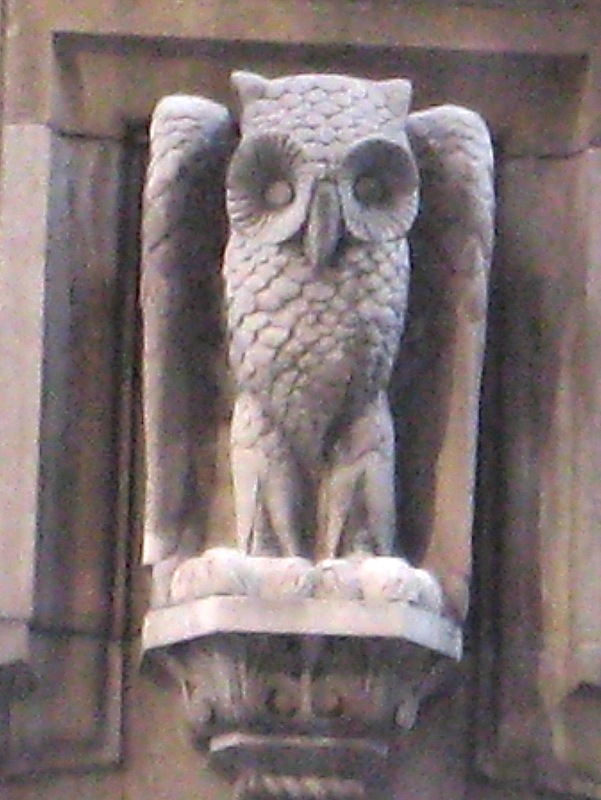 At right, one of many huge owls guarding a (NYU-owned, maybe?) building on Broadway and East Fourth Street. 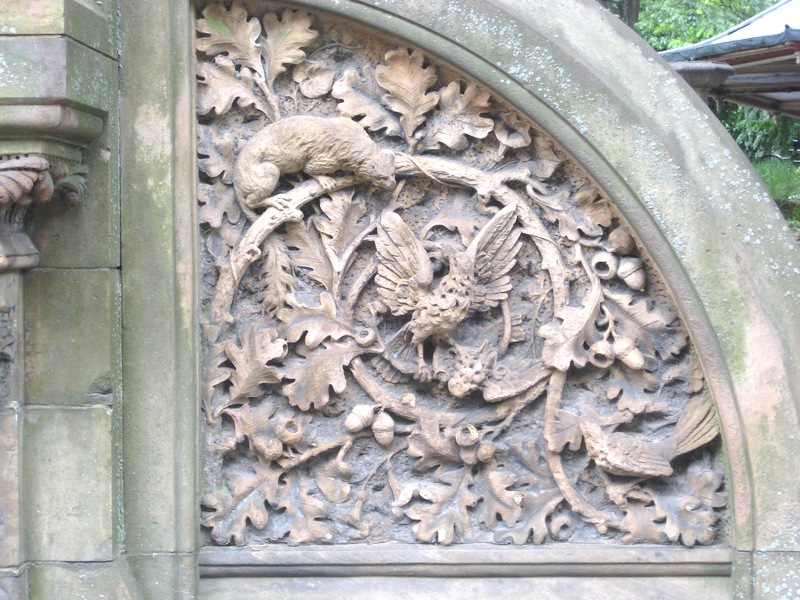 This funny little owl on the tree limb at left is part of a gate at Central Park’s Bethesda Terrace. 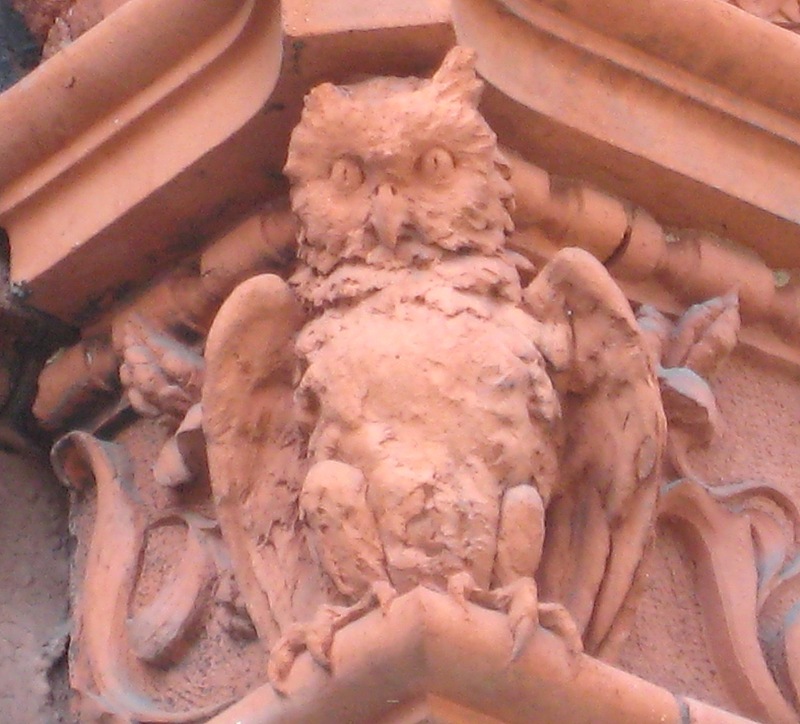 I’ve always been partial to this terra cotta owl carved into the ornate Stuyvesant Polyclinic building on Second Avenue and St. Mark’s Place. He looks menacing. At left, big peepers on a midtown Lexington Avenue building. 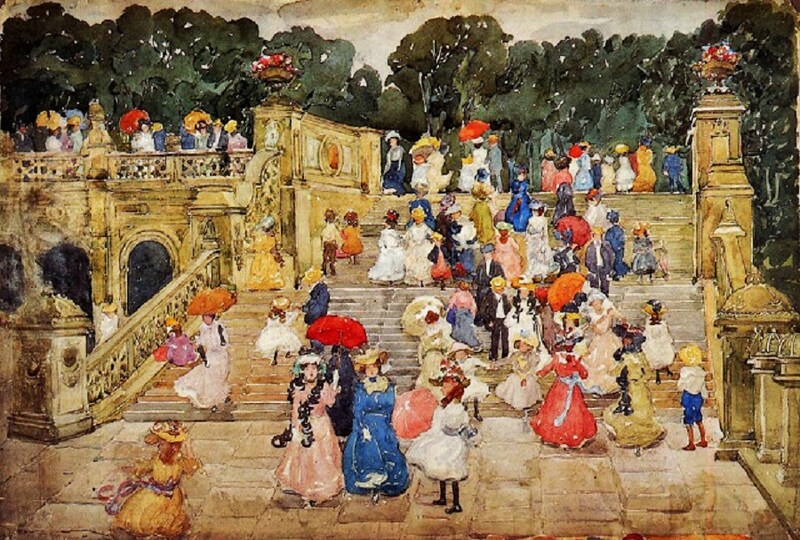 Split-level Bethesda Terrace, near 72nd Street overlooking the lake, was designed in the 1860s to be the heart of Central Park—a grand place of people-watching and socializing. 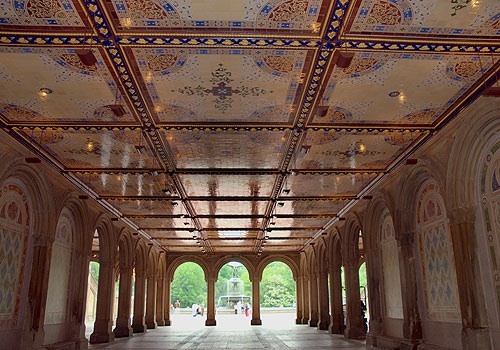 It’s the site of some of the park’s most beautiful features: Bethesda Fountain, the “Angel of the Waters” sculpture, and the tiles adorning the ceiling of the ground-level arcade. 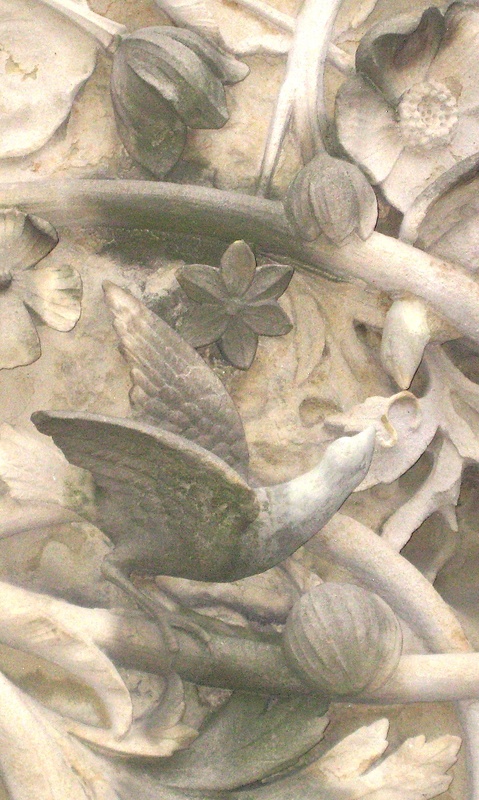 But don’t overlook the gorgeous ornamental stone carvings on the staircases leading to the fountain. British-born designer Jacob Wrey Mould created these whimsical reliefs of birds and foliage—a lovely reminder of spring and summer all year round. 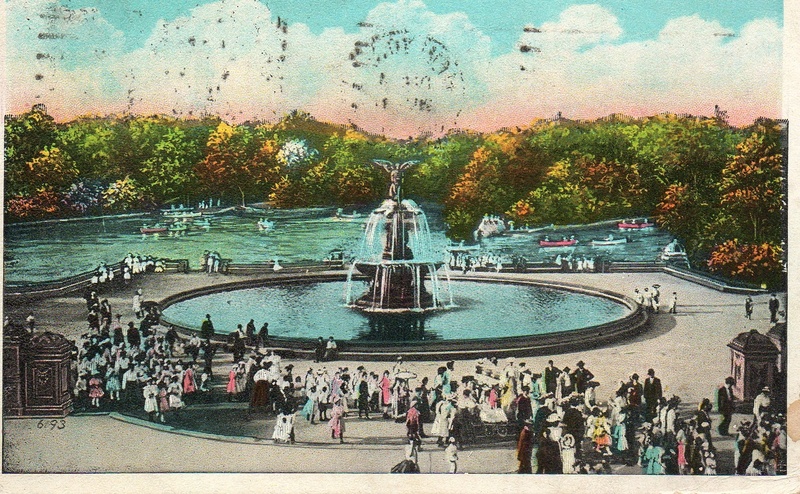 Rowing in Central Park’s lake and gathering on Bethesda Terrace appear to have been as popular 100 years ago as they are today. The fountain, unveiled in 1873, is topped by a sculpture called “Angel of the Waters,” by Emma Stebbins. She was the first woman commissioned to create art in a city park. This painting, by John O’Brian Inman, depicts a lovely nighttime scene at the lake in Central Park, with Bethesda Fountain in the background. 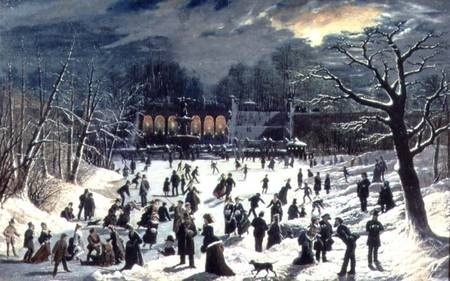 Ice skating became hugely popular in the second half of the 19th century. Skating clubs formed, and tens of thousands of New Yorkers would show up during prime winter days at the lakes of the city’s new parks. Central Park officials had a way of letting skaters know when it was safe to go on the ice: A red ball would be raised from a bell tower in the park, near where Belvedere Castle is today. A red pennant hoisted over the middle of the lake, however, was a warning that the ice was dangerous.